In the 18th century, the Convent of San Zaccaria held the dubious honour of boasting a very fashionable salon in the convent parlour (the subject of paintings by Guardi in the Ca’ Rezzonico and Pietro Longhi in the Museo Correr), and the nuns who frequented it were the source of many a scandal—although this was nothing new in the city's annals. Nearly half the nuns in Venice, and most of the noble ones, had taken the veil not out of religious vocation, but because most noble families could provide suitably enormous dowries only for one or two daughters without breaking the bank. Many of these unwilling nuns lived miserable lives, cloistered in the most beautiful city in the world: in the 17th century, one nun, Arcangela Tarabotti, in the convent of Sant' Anna vividly described their sense of betrayal. By the next century, at least in San Zaccaria, the favoured convent of the patricians, life wasn't so bad. 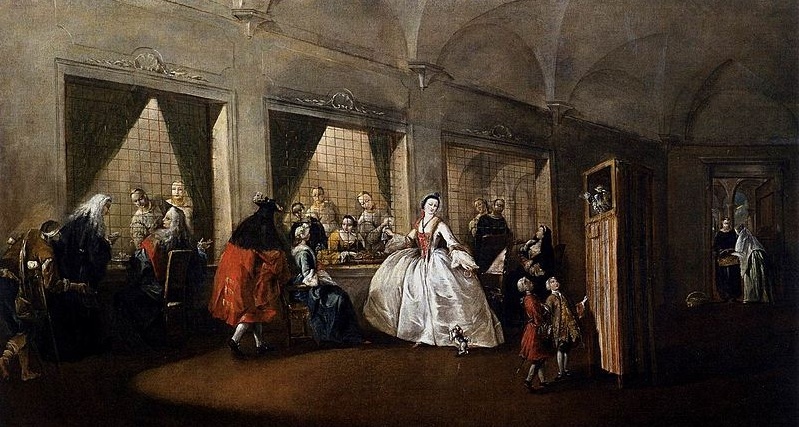 Many girls actually went willingly, happy to escape parental restrictions; supported by handsome incomes and pin money from home, they enjoyed a series of balls, concerts, dinner parties and games of chance and each, of course, had her cavaliere servente. When convent behaviour became too outrageous, the once-fearsome Council of Ten threatened prison sentences; but when the Council sent its spies and agents to enforce its mandates, the nuns pelted with stones and sent them on their way.